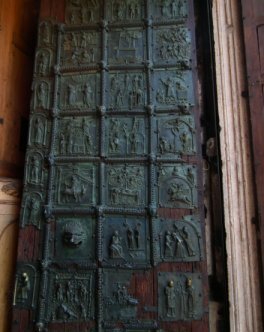 As visible in the photograph below, bronze plates of figures run down the left side of the right door. 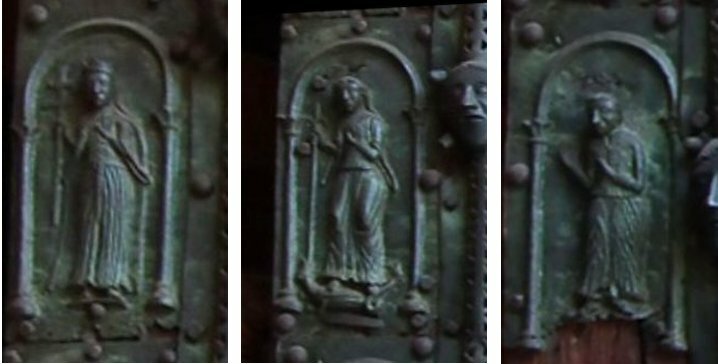 There are smaller images on the left door, but they are difficult to identify and reproduce. The images show saints - and others! Apologies for the quality of the reproduction. 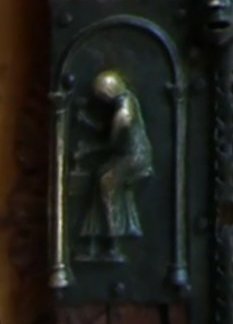 Peter is identifiable, as he is holding a key: Paul's name is inscribed on his image. St Helena is identifiable by the cross, her attribute. The other two characters are rather interesting. Matilda of Canossa, Margrave of Tuscany, was a wealthy and powerful Italian aristocrat. She is best known for her support for the Pope, Gregory VII. It was at her castle that the Holy Roman Emperor Henry IV stood in penance for three days in the snow while the pope relaxed in the warm inside. She appears here because of her patronage of the Abbey. The third figure is her husband, Godfrey, duke of Upper Lorraine, also known as Godfrey the hunchback. I have these identifications on good authority, but are they right? The figure of Matilda appears to killing a dragon beneath her feet. The image looks feminine, to be sure, but at first glance I thought of St Michael, or, as there are no angel wings, St George. The lowest image shows a sculptor hard at work. A self portrait by one of the creators of the panels? No-one knows.